In the old days if you wanted to listen to shortwave you had to turn a dial. Later, you might have been able to tap in a frequency with a keypad. With modern software-defined radio (and the right hardware) you can just listen to the entire high-frequency spectrum at one time. That’s the idea behind KiwiSDR, an open source daughterboard (ok, cape) for the BeagleBone. The front end covers 10 kHz to 30 MHz and has a 14-bit converter operating at 65 MHz. There is a Xilinx Artix-7 A35 FPGA onboard and a GPS, too. The design is open source and on GitHub. The interface uses the OpenWebRX project for a powerful HTML 5 interface. You can see a video of its operation below or, if you can get one of the four available slots, you can listen online. From a network point of view, the demo station in Canada worked best for us. However, there are also stations in New Zealand and Sweden. 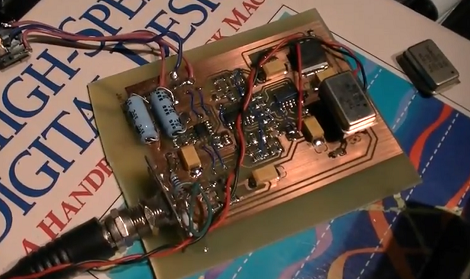 If the crystal is “easily” scavengeable, and the rest of the radio is easily home-made, the tuning capacitor (obtainable from old AM/FM radios) can become the sticking point. So [Paul] cut up two aluminum “beverage” cans, wrapped the inner one in electrical tape, hooked up wires and made his own variable capacitor. By sliding the cans in or out so that more or less of them overlap, he can tune the radio to exactly the crystal’s natural frequency. If you’re interested in building a Mighty Mite, you should definitely look at the topic on Soldersmoke. There are more build instructions online as well as plans for an optional filter to take off the harmonics if you’re feeling ambitious. If you’re not a Morse code wiz, we can’t help but note that you could replace the key with a simple FET (we’d use a 2N7000, but whatever) and then you’ve got the radio under microcontroller control. Scavenge through Hackaday’s recent Morse code projects for ideas, and we’re sure you’ll come up with something good. After getting his hands on this relic [Gregory Charvat] manage to hack it, converting the receiver into a transceiver. It may be old, but the R-390A is nothing to scoff at. It’s abilities include AM, code, and FSK operation from 500 kHz to 32 MHz. But it is a receiver with no way of transmitting on the same bands. This is where [Gregory’s] hack comes into play. 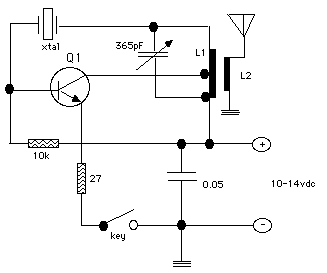 He rerouted the variable-frequency oscillator feed inside of the R-390A in order to use his 20M single-sideband unit. Basically what this does is allow him to control everything from the 390, using the microphone from the SSB — along with some switching hardware — to transmit his own messages. His demo video starts with him making a few contacts using the hacked equipment. He then spends some time at the whiteboard explaning the changes. This portion went over our heads, but it becomes more clear when he cracks open the case and shows the actual modifications. [Jeri Ellsworth] has been working on a direct conversion receiver using an FPGA as an oscillator and a PC sound card DSP. Being the excellent presenter she is, she first goes through the history and theory of radio reception (fast forward to 1:30), before digging into the meat of the build (parts 2 and 3 are also available).